About two weeks ago, I put finished an awesome book. 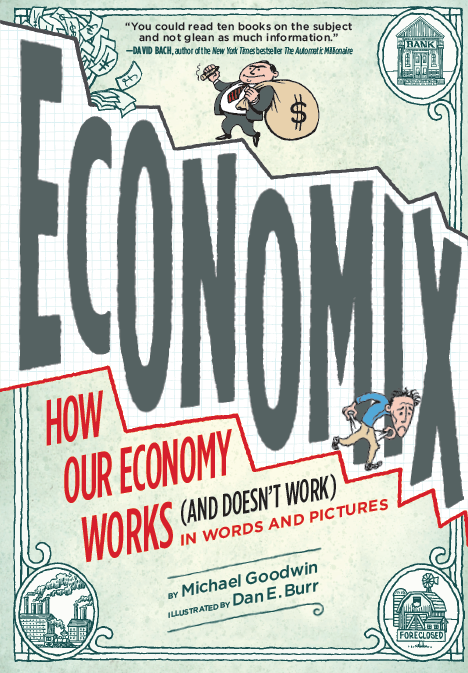 My review of it one-sentence review of it on Facebook was clear and simple: "one of the most coherent texts on economics ever (probably cause it's a comic book!)." 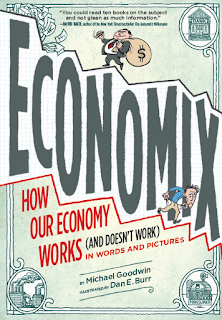 Michael Goodwin & Dan E. Burr's Economix: How Our Economy Works (And Doesn't Work) In Words and Pictures explained economics in a way that made sense--no longer grounded in simple theory but in the actual history through which they developed. I was so excited about the experience, I look to contact the author and artist to see if they would let me interview them and they kindly agreed. In this post, I'll interview the author, Michael Goodwin and follow up with the artist, Dan E. Burr next. Lance: What inspired the idea for the book? Michael: Really, it was my interest in history. History keeps coming back to the same economic patterns, and I thought I should understand them. But when I looked at economic textbooks, the things I was interested in either weren't there, or they were stuck in sidebars without any context. So I went back to the original sources, especially Adam Smith. I thought I'd known what Smith said--free markets rah rah rah--but he was so much richer than that. He includes everything from Carthaginian history to the price of kelp to the beauty of Irish prostitutes in London. As I read him and others, I realized that there was a whole story there that nobody was really telling. Michael: Hmm. Smith is up there, but I'd say that my favorite economist is probably John Kenneth Galbraith. Not that he was right about everything, but he's the only economist who really tried to nail down the modern corporate economy the way Smith nailed down the economy of his day. In another sense, my favorite would be the 19th-century social thinker Henry George, just because he was so much fun to read--clear, moral, and lively. I would save his books to read as a treat for when my eyes were glazing over from reading other economists. Lance: Why choose comics to communicate the information? Michael: Well, I grew up in a household where comics were taken seriously, even before Maus (my stepfather is the cartoonist Rick Meyerowitz). I knew that comics are just plain more accessible and memorable. That especially mattered because the book was about a really intimidating subject; I was trying to reach the sorts of people who are scared away from the topic normally. Lance: Do you read comics? Which ones? Favorites? Michael: I do; I mostly prefer nonfiction comics, but then I mostly read nonfiction in general. I'll read anything by Larry Gonick, by Guy Delisle, by Joe Sacco, by Harvey Pekar, I could go on. Lance: Who were influential comics/authors in the creation of your work? Were you channeling Scott McCloud? Larry Gonick? Rick Geary? Michael: Larry Gonick was the big one; he was half the reason I loved history in the first place. I'm also a big fan of Scott McCloud's work. I liked Rick Geary's stuff but I didn't know he'd done all the stuff he's done; I'm looking him up now and thinking I have to read some of his pieces. Lance: Was Gonick’s Einstein-like Guide the inspiration for creating a similar icon to represent yourself? Why did you feel the need for the presence of this character? Michael: Both Gonick and McCloud inspired me to use a narrator, but the reason I made the narrator represent me was to drive home the point that this is my book, from my point of view. If I'd had the narrator be Adam Smith, or a talking coin, or something like that I would have been giving the book an authority that I don't want to assume. There are far too many authors setting themselves up as authorities already. Lance: What challenges came up in the use of communicating this as comics? Michael: Well, it's a huge subject, and using the comics form meant I had to keep my word count way down. You can actually read Economix in an afternoon. Keeping the story from overflowing its banks was a real challenge. Lance: How did the collaboration come about? Michael: I always knew that I would have to have someone draw it--my crude stick figures would have gotten old fast. My agent knew Dan and recommended him, and Dad's samples were like ten times better than anyone else's. Lance: How did the partnering work for the project? Lance: What challenges did you run into in terms of content and layout? Michael: That's more of a Dan question, but the book is still sort of dense; getting everything to fit while still having it visually inviting was a big challenge. Lance: How hard was the selling of the idea to a publisher as a comic? Michael: Only one place--Abrams ComicArts—wanted it, but one is enough. It specializes in comics (obviously) and particularly looks for unusual comics that don't fit existing categories. So it was a good fit. But still, I had to write the entire first draft before I even tried to sell it, because this is my first comic and my first book; nobody was going to give me a contract on my say-so that I could do it. Lance: What was the biggest surprise in the whole experienced of creating and publishing the graphic novel? Michael: How many other people have gone above and beyond to help it see daylight. People really got behind this book. Lance: Any good examples of people that helped along the way to make the book a reality? Michael: The obvious one is Dan; I think he cared a lot more about this book than he would have about a superhero comic that took the same amount of work and paid the same. It was a relief to know that he was as committed to seeing the book through as I was. The publisher, Abrams, has been great too; every single author friend I have complains that their publisher didn't get behind the book. I'm like the only author who doesn't have that complaint. Lance: How has the book received? What critiques have you received from the book in terms of content? political vantage point? artistic approach? Michael: It's been received really well. The reviews have ranged from positive to raves. Some people aren't entirely comfortable with the political content, but the only people who haven't liked it are a couple of conservatives on Amazon reviews. Lance: What would you change or revise in hindsight about the book in terms of content, art, voice, etc? Michael: Nothing about the art or the voice. I have some content tweaks but nothing major; as Dan can attest, I'm always tweaking. I do find myself wishing that I had like ten more pages of space to put in some stuff I cut out. Oh, and in one panel I'm talking about how it may not be too late to stop certain environmental disasters, and the illustration is a flooded lower Manhattan. And not two months after the book is published, lower Manhattan floods. So that was a bad example. I would change that. Lance: At one point in the book, you step out of the book and speak about how you're directly injecting your values--what let to that decision? Michael: Well, as I say early on, every book on the economy reflects the author's values; the typical econ textbook is very political in what it chooses to talk about and what it doesn't. (For instance, since the 1950s the military budget has arguably been the single biggest fact in the economy, but you can read entire textbooks that don't mention it). But when you're dealing with the past, you seem more objective even when you're taking political stances--nobody sane thinks slavery or child labor was a good idea anymore. So my editor thought that the fact that my book is coming from a political point of view needed to be emphasized as the book reached the present day and economic debates that haven't been settled yet the way slavery has. And I agreed. Lance: It's probably about 6 months to a year since you finished the book; do you see any other changes or developments in the economy (positive, negative or neutral)? Michael: I'm waiting to see what happens with the "fiscal cliff" negotiations; it's a totally artificial crisis, but as Naomi Klein points out in The Shock Doctrine, artificial crises can become real crises if we use them as an excuse to give up the advances we've fought for. Lance: Current and future projects? Michael: Right now I'm just enjoying not having this book over my head. I'm planning another book; it will basically give some of the parts I had to take out of this book, but I'm not sure which parts yet. Stick around for the next interview with artist Dan E. Burr. For more information about their book and future endeavors, check out their website, Economix Comics.